Here comes the moment of truth. Modi prides himself on offering an "incorruptible" government. Will he dilute the Prevention of Corruption (Amendment) Bill to coax the administration's fealty and compromise his self-image? 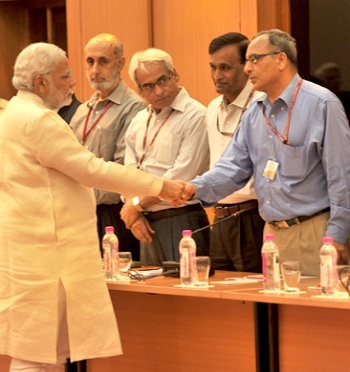 IMAGE: When Prime Minister Narendra Modi met the Secretaries to the Government of India after taking office in 2014. Photograph: NarendraModi.in. In the aftermath of the conviction of three top officials in the coal scam cases, and the bureaucracy's pressure to redo the law, the Prime Minister has to reconcile this with his public image as a foe of graft. After a seemingly calm and harmonious relationship with officialdom for three years, PM Narendra Modi is up against a test that could stabilise, enhance or reconfigure this equation over the next two years of his present tenure. For, Modi could be held answerable for his oft-repeated exhortation to the mandarins to be "decisive", "fearless in decision-making" and "think out-of-the-box". Prompted by the conviction and sentencing to jail of former coal secretary Harish Chandra Gupta and two serving Indian Administrative Services officials by a court, the civil service is waiting to see if the government amends a clause that for decades has hung, sword-like, over their head: Section 13 (1) (d) (iii) of the Prevention of Corruption Act (PCA), enacted in 1988. According to a well-placed source, the provision will "most likely" be deleted by Parliament, in keeping with the recommendations of a Rajya Sabha committee whose report was given on August 19, 2016, without having been discussed. The provision stipulates that any pecuniary advantage given by an officer to a person is punishable, unless it is in the public interest. The law does provide for 'mens rea' (committing a criminal act with a culpable state of mind) or 'mala fide' acts as pre-requisites for taking criminal action but, says a senior bureaucrat, "In the process, acts done in good faith are not being protected." The government is increasingly of the view that the provision has to go because, in the words of a Cabinet minister, "No dispensation can function if it continues." The minister's case was that in the post-economic reforms era, when licences and natural resources are allotted to private players to spur the economy, the latter are "bound to benefit once or on multiple occasions". "What one committee may conclude was done in the public interest may be questioned by another. These decisions are made under different laws and sometimes in consultation with a state government. One can't say no mistakes will be made, as at times facts are wrongly furnished or a decision is simply bad. Are you, then, going to assign criminality to one person and hang him?" he asked. Piyush Goyal, in charge of power, coal, renewable energy and mines, whose ministry allocated 82 coal blocks through e-auctions and allotments after the Supreme Court quashed the allocation of 214 of these in 2014, said, "We have nothing to do with the sentencing of these officials. It was a court order, emanating from something that happened in the (previous) UPA regime. We work in an honest and transparent manner; so, no official need fear anything." The Prevention of Corruption (Amendment) Bill, 2013, amends the Prevention of Corruption Act, 1988. The Act covers the offence of giving bribe to a public servant under abetment. The Bill makes specific provisions related to giving a bribe to a public servant and giving a bribe by a commercial organisation. The Bill redefines criminal misconduct to cover only misappropriation of property and possession of disproportionate assets. The Act requires prior sanction to prosecute serving public officials. The Bill extends this provision to former officials. The Bill makes giving bribe a specific offence. There are diverging views on whether bribe giving under all circumstances must be penalised. Some have argued that a coerced bribe giver must be distinguished from a collusive bribe giver. The Bill has deleted the provision that protects a bribe giver from prosecution for any statement made by him during a corruption trial. This may deter bribe givers from appearing as witnesses in court. The Bill has replaced the definition of criminal misconduct. It now requires that the intention to acquire assets disproportionate to income also be proved, in addition to the possession of such assets. Thus the threshold to establish the offence of possessing disproportionate assets has been increased by the Bill. By redefining the offence of criminal misconduct, the Bill does not cover circumstances where the public official uses illegal means, abuses his position or disregards public interest and obtains a valuable object or reward for himself or another person. Under the 1988 Act, the guilt of the person is presumed for the offences of taking a bribe, being a habitual offender or abetting an offence. The Bill amends this provision to only cover the offence of taking a bribe. However, officialdom wants more than assurances. Anil Swarup, who was moved from coal to school education as a secretary in 2016, encapsulated the anxiety in the civil service in a post on social media on March 5, days before Gupta was convicted. "One of the biggest challenges in life is to be pushed to do what you believe is incorrect. What is worse, you have even to justify it. The best way to obviate such challenges is to evolve in a manner that those in the wrong find it extremely difficult even to approach you. It is tough but eminently possible, specially for a civil servant." He went on, "Once the other party knows that your 'desires' are limited, half the battle is won." Parsed, Swarup's comments meant that a bureaucrat can stand his ground against political bosses and/or vested interests if he is principled and doesn't succumb to pressures. How, then, did the law ensnare the "principled" Gupta? Swarup refused to add anything. However, another top official cited several reasons for why he believed the "hapless" Gupta "got caught". He said then Prime Minister Manmohan Singh, doubling as coal minister at that time, had approved the allocations in all cases, and that in seven of 10 cases, the Central Bureau of Investigation (CBI) had not found incriminating evidence against the former secretary and had asked to close the cases. But, the court would not agree. The screening panel to recommend allocations was helmed by Gupta, but had other members from the administrative ministries, the relevant state governments where the coal blocks and end-use plants were located, Coal India, etc, "who together were responsible to provide all duly verified facts, recommendations and opinions", it was a "recommendatory" and not a "decision-making" body. And, finally, there was no charge of personal gain, gratification or mens rea in any case against Gupta. The official cited a similar case, dating back to 2002 when Atal Bihari Vajpayee was the PM, to illustrate his point about the use of "double standards" to determine corruption. When fuel pumps were apportioned and cooking gas distributors were appointed in a "mala fide" manner on the suggestions of dealer selection boards that were chaired by retired judges and judicial officers, the allotments were cancelled. When the apex court heard the case, the board heads were neither faulted for not verifying the facts and nor were criminal or administrative culpability fixed on them. Even so, T S R Subramanian, a former cabinet secretary, refused to be persuaded by Gupta's votaries. He said that the proposed deletion of Section 13(1) (d)(iii) and possible addition to Section 17, mandating approval of a "competent authority" before inquiring or investigating an officer, serving or retired, will "surely cripple whatever little possible use the PCA can be put to, in tackling the widespread corruption in our administration". The solution, he insisted, lay "in not diluting our laws, but in cleaning up our investigating agencies and speeding the legal procedures. The real solution lies in high quality political management of the issue of corruption". On Subramanian's latter point, even cynics in the Modi administration concede that on the integrity quotient, the government has been clear so far, raising the administration's morale to a degree. A top officer, who admitted to having a dim view of the system's efficacy in nailing institutionalised venality, said: "The main difference between the (present) NDA and (earlier) UPA governments is financial integrity. Even if the temptation to make money exists among some ministers, Modi has put the fear of God in them. We are reasonably confident that we will not be coerced into doing wrong things and being made to pay for the omission or commission." A cabinet minister said Modi's mantra for the bureaucracy was "simple and straight". "Appreciate good work and demand accountability for bad work," he said. "I observed how he worked with IAS officers in Gujarat (as the chief minister). He motivated them, gave a clear road map, setting everything from A to Z, so that there was no confusion about the chain of command and ensured there was no political interference or influence, not even from the RSS (Rashtriya Swayamsevak Sangh)," the minister said. 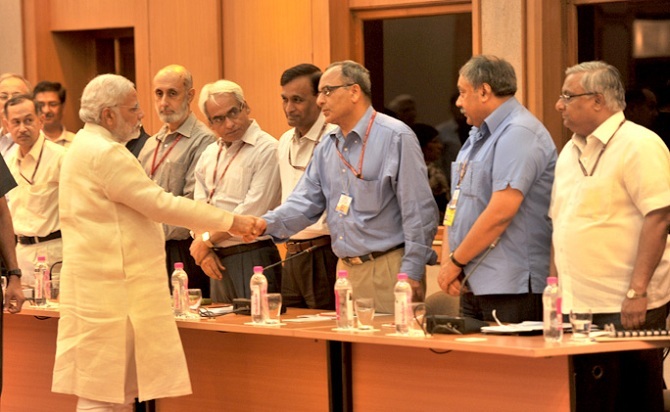 In fact, Modi has packed the upper echelon of the establishment with Gujarat-cadre IAS officers. Of whom, the ruling party's vice-president and Rajya Sabha member Vinay Sahasrabuddhe speaks of as being minted from the "'karmayogi' and not the 'karamchari' school of administration". "As 'karmayogis', the officers were infused to work with passion and yet be detached and not have immediate expectations," he says. Even so, a Bharatiya Janata Party functionary who works in close concert with the government concedes it is a "long haul" before the "cosy" politician-bureaucracy nexus is demolished. "For the first time, those ensconced in the Delhi structures have realised that Modi is a team captain. His intentions have never come under a cloud. He has a focused agenda and purity of purpose, without personal motivations. This gives a shield of protection to government employees," the functionary said. An Uttar Pradesh cadre official, who acknowledged to morphing from being a Modi sceptic to an endorser, said the first feature that "impressed" him was the "unified command model" put in place by the PM shortly after taking office. "He made it clear that power will flow from the Prime Minister's Office [PMO] and the PM will have the last word on key appointments. Modi's predecessor was competent, but my impression was he never had a grip over governance," the officer said. Equally significant for the bureaucracy was Modi's use of the 'Pragati', an interactive platform that facilitates video-conferencing with data and geo-informatics between the PMO, Union government secretaries and state chief secretaries, to monitor the implementation of projects. "We have come out of our silos. An officer in the education department can access what's happening in agriculture or rural development," a bureaucrat said. Much of the praise for Modi is, however, conditioned by how far he will go in "safeguarding" the bureaucracy's interests. Here comes the moment of truth. Modi prides himself on offering an "incorruptible" government and never tires of reminding people of the scams the Congress party was enmeshed in. Will he dilute the PCA to coax the administration's fealty and compromise his self-image? On the proliferating social media sites, Modi loyalists have cautioned him to not "indulge" the IAS lobby. Modi@3: Have achche din arrived? Who is Modi's best minister?